January 25, 2016 - Boeing and U.S. Air Force crews complete the KC-46A Pegasus tanker’s first refueling flight following takeoff from Boeing Field in Seattle. 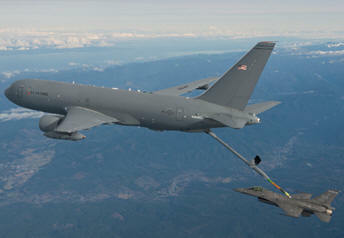 The Boeing/Air Force test team aboard the KC-46 offloaded 1,600 pounds of fuel to an F-16 fighter. On Sunday, Boeing and U.S. Air Force aircrews successfully completed the KC-46A tanker’s first refueling flight in the skies above Washington state. Following takeoff from Boeing Field the test team worked through a series of test points before smoothly offloading the fuel to an F-16 fighter aircraft flying at 20,000 feet. “Today’s flight is an important milestone for the Air Force/Boeing team because it kicks off the Milestone C aerial refueling demonstration, which is the prerequisite for the low-rate initial production decision,” said Col. Christopher Coombs, U.S. Air Force KC-46 system program manager. “We have a lot of work yet to do, but this is an exciting time for the airmen who are preparing to fly, maintain and support the KC-46 Pegasus for decades to come.” During the 5 hour and 43-minute flight, both Boeing and Air Force air refueling operators accomplished multiple contacts with the F-16 that confirmed the system was ready to transfer fuel. Master Sgt Lindsay Moon, U.S. Air Force KC-46 air refueling operator, then “flew” the tanker’s 56-foot boom downward and waited for the F-16 to move into position before fully extending the boom into its refueling receptacle. The KC-46 offloaded fuel to the fighter and when the fuel transfer was complete, the system automatically turned off the pumps and Moon smoothly retracted the boom. The KC-46A that accomplished today’s refueling milestone will soon begin refueling a number of other military aircraft as well, including a C-17, F/A-18, A-10 and AV-8B. Also known as EMD-2, the tanker made its first flight September 25, 2015 and has now completed 32 flights. The program’s first test aircraft (EMD-1), a 767-2C, has completed more than 260 flight test hours to date since its first flight in December 2014. EMD-3 and EMD-4 will begin flight testing later this year. As part of a contract awarded in 2011 to design and develop the U.S. Air Force’s next-generation tanker aircraft, Boeing is building four test aircraft – two are currently configured as 767-2Cs and two as KC-46A tankers. The KC-46A is a multirole tanker Boeing is building for the U.S. Air Force that can refuel all allied and coalition military aircraft compatible with international aerial refueling procedures and can carry passengers, cargo and patients. Overall, Boeing plans to build 179 KC-46 aircraft for the U.S. Air Force.